Who can explain the vicissitudes of the imagination? My husband and his band members of CLIMATE STRANGE were playing their piece “Crystal Acrobat.” It was about looking out the window at the snow. I was drawing, enjoying their music, and out came this piece–notwithstanding the fact it is a hot day in the middle of June here in the Pacific Northwest! I often think of my pen and ink drawings as “warm ups.” Although in this case, I believe it is probably the finished piece. My artwork also combines with Surrealism given its sinuous exaggerations and mythic/symbolic imagery and Inner Vision connected with the unknown. I very much believe in Carl Jung’s idea of the Collective Unconscious for instance–and its effect shows in my work. My work has been influenced by my early exposure to the art of Basque, Celtic and non European peoples while also being married to our contemporary culture and the surrealists of old. So this all makes it kind of hip and kind of earthy and kind of ethereal combining Heaven and Earth. Is that right? For me its just what I do, although I also try to develop and challenge myself, and thus push the envelope. I hope you enjoy! And think about buying (or showing) some of my pieces. Shortly I will be connecting this website with my sales page on Fine Art America. You can also contact me directly at bgarthart@gmail.com if you are interested in buying some of my pieces — or showing them in your gallery! 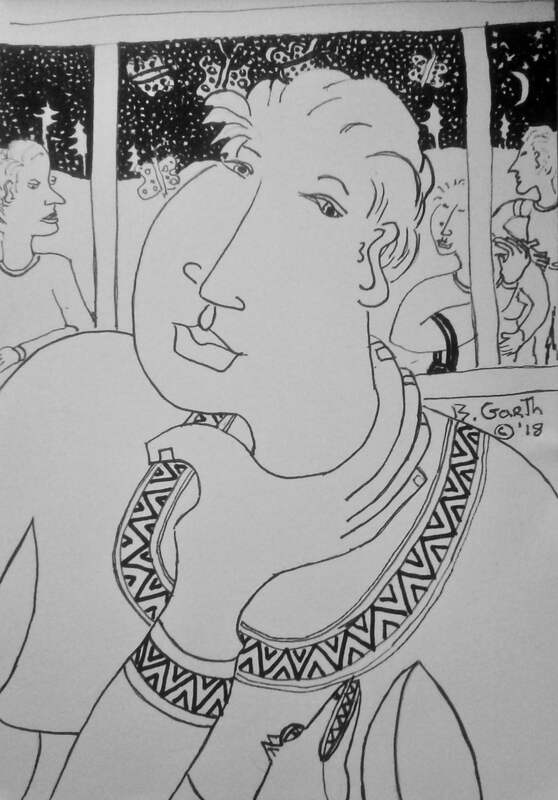 I made this pen and ink drawing some years ago for a poetry reading series I was hosting in Los Gatos at Cafe Rouge. I always thought it would make a great painting. The iguana is whispering something in the guy’s ear. I think maybe he’s listening even though there is a pretty woman sitting next to him looking expectant. Or is she just figuring him out, as in is he really real?? Outside there is an alligator, who seems to know what is going on. Yes really, what is up? Why are you so self protective?? Why look at me and not her? So many of these drawings I can choose to make paintings from. I am getting pretty excited! I have been musing about what style it is I exactly have–and have been thinking I should call it: Ancient/Modern/Surreal Art. Or is that just too clumsy?? Perhaps I should just call it Magical Realism?? I need to think on it. My work has never fit into any kind of box, which on the positive side makes it unique. But for purposes of the Internet, I need to find a way to classify what I do to get those who might be interested in my work to have any easy path to my site. So my dilemma dear readers, lol! Certainly I have been influenced by ancient art from an early age. I was exposed to Native American art here in the Pacific Northwest as well as ancient and indigenous art from around the world as a child. My parents worked as anthropologists when I was very young. In addition I was very much influenced by my great Aunt Lottie’s amazing artwork and rugs she brought back from the Philippines. I have also been influenced by the early moderns–Picasso, Modigliani, Gaugain, Matisse, Cassat and Kahlo amongst many others. Further I very much interested in imagery inspired by Carl Jung’s notion of the Collective Unconscious as well as New Age metaphysics such as astrology and the tarot. I tend to focus on feelings expressed in the body language between people and our necessary connection with the Earth and its creatures–including the mythic dimension. No matter what, I have been going through a major shift, just having moved back to the Pacific Northwest–so I am now setting up my new art studio. I want to continue painting and drawing on canvas and paper. But now, in addition, finally also get back to ceramic sculpture and wall plaques. My good friend and tarot scholar Christine Payne Towler has also been encouraging me to begin a project of creating a new tarot deck–since, as she says, my work is iconic in nature. I am itching to begin! Being here by the Columbia Gorge is for me like coming home with its beautiful vistas, abundant trees and wildlife and friendly people. This truly is where my heart is!